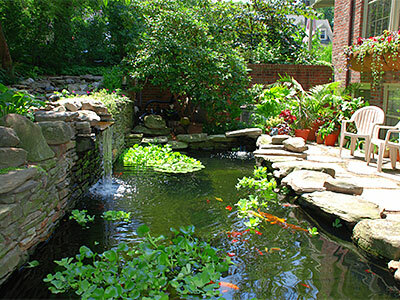 At Preferred Landscape we have many years of experience in creating stylish water Features for residential and commercial properties throughout the greater Louisville, Kentucky region. 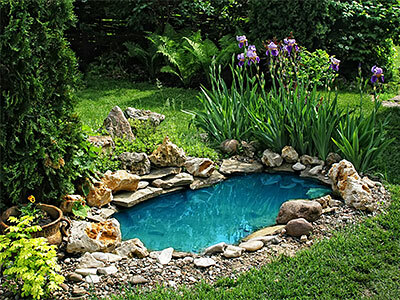 Water Features are becoming a popular landscaping addition for homeowners because they are so aesthetically pleasing and they also provide a place where you can relax and enjoy the peaceful atmosphere after a hard day's work. Why spend money having to go out to places where you can relax with friends and family when you can create your own water oasis in the comfort and convenience of your own backyard? Installing a water feature in your landscape setting will not only increase the value of your home but it will add to the overall aesthetic appeal of your property at the same time; it really is a win win situation. The condition and state of your landscapes plays a large role in the presentation of your property as a whole. Our team of professional water feature designers and contractors will guide you through the process from the design phase, the installation and will also provide you with all the maintenance information required to keep your water feature looking and functioning great! At Preferred Landscape we use top quality products and materials to construct our Water Features. We can recommend the best type of material for your property; one that will blend in well with the surroundings and one that will be durable and withstand all types of climate and weather conditions. The most common types of materials used for the construction of water features includes natural stone, precast stone, stone veneer, concrete and masonry. Natural stone always gives that natural look and feel to any water feature but it does come with a bit more of higher a price tag. There is now a range of manufactured concrete products on the market that imitate the look of natural stone, but without all of the expense. Natural stone is also a lot heavier than concrete products, which makes it a lot more difficult to install and thus increases the labor costs and time even more. But it will last longer than all other building materials for it is natural and can withstand harsh weather conditions. Whatever type of material you choose, Preferred Landscape will construct a water feature that you will be so happy with! The addition of a water feature will transform your mundane backyard area into a natural looking environment where you can escape to and just enjoy the tranquil atmosphere that water tends to create. There is nothing more relaxing than the sound of trickling water. We can help you choose plants, trees and shrubs to finish off your new. It is important to select plants that will thrive in your location and climate without you having to do a whole lot of maintenance so let our team select a range of plants that will enhance you water feature and not require much of your time at all. Preferred Landscape prides itself on maintaining its great reputation; the way we do this is making sure that you have friendly assistance you require throughout the whole project. And that our craftsmanship is top quality!